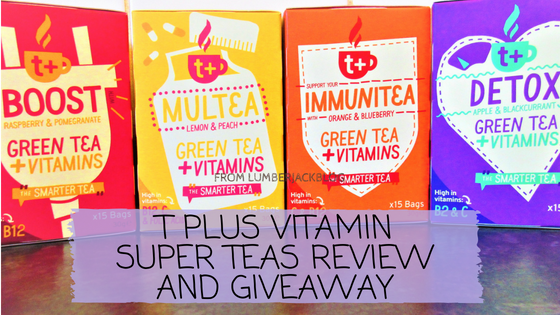 We received T Plus Vitamin Super Teas to review this week and have a bundle to giveaway to one of our readers too! T Plus Vitamin Super Teas blend powerful herbs, green tea & natural fruit flavours. With 50% RDA of 9 daily essential vitamins in every bag too. The vitamins include B6, B12, C and Folic Acid in every clever tea bag. T plus is more nutritious, better tasting and better doing than any existing ‘health tea’. They donate 10p from the sale T Plus Vitamin super teas to spread the power of vitamins with charity partner, Vitamin Angels and help #sharethehealth. T plus drinks are on a mission to make the world of tea a little smarter, one teabag at a time! There are 4 teas currently available from T plus, each one comes as a box of 15 tea bags. T+ Multea Vitamin Tea – Nutrient-dense lemon & peach flavoured Multea contains a blend of multi-beneficial herbs. These herbs include rosemary, cardamom, spearmint with green tea. With 50% RDA of 9 daily essential vitamins (including B12, folic acid, B6 and C) to ensure you have the perfect daily cup of super tea. T+ Boost Vitamin Tea – A new generation raspberry and pomegranate flavour energy tea. Made by blending together herbs – yerba mate and ginseng with antioxidant-packed green tea. Plus 50% RDA in energy-releasing B vitamins (vitamins that support normal energy-yielding metabolism and the reduction of tiredness and fatigue). T+ Immunitea Vitamin Tea – An orange & blueberry flavoured immune system boosting blend of functional herbs & green tea. Immunitea contains 50% RDA in 9 daily essential vitamins including Vitamin C which contributes to the normal function of the immune system. Herbs Echinacea and ginseng along with antioxidant-packed green tea help keep cells healthy. T+ Detox Tea – An apple & blackcurrant flavoured cleansing blend of herbs, green tea & 50% RDA in 9 daily essential vitamins including vitamins B2 and Vitamins C. These vitamins help protect cells from oxidative stress. Herbs used are milk thistle, dandelion root and ginger root which have been used for centuries for internal cleansing to perfect this detoxing super tea. I tried out the T+ Detox Tea and the T+ Multea with this fab Keep cup! These teas are packed full of flavour (and vitamins!). The flavours work really well together, I love the Detox tea. If you are looking for a green tea that is enjoyable and full of goodness then T plus teas are fantastic. Fancy trying out T plus vitamin super teas for yourself? Enter the giveaway below for a chance to win all 4 vitamin super tea!